CD reviews: "Braggtown" and "Minions Dominion"
These reviews first appeared in Turbula in November 2006. Any release from the Marsalis clan is a welcome event  pianist Ellis and his musician offspring are America's musical first family, both preserving and pushing forward jazz with an authority and passion drawn from their family's deep roots in New Orleans. But two releases in short order? Truly a treasure, particularly when one of the discs is from trombonist Delfeayo, whose last recording was "Musashi" a decade ago. Delfeayo has spent most of his career in producing others' recordings (including those of his brothers), but, as he proved at his coming-out party when the Berklee School of Music jazz band performed at the National Association of Jazz Educators in 1989 when the organization's annual conference was held in San Diego, he's a monster slide trombonist. Which is a good thing, because for this date he's surrounded himself with some monumental talent: big brother Branford on tenor sax, Donald Harrison on alto, the great Mulgrew Miller on piano, and a dynamite rhythm section of Elvin Jones on drums and Robert Hurst III on bass. You better be bringing it with that kind of genius all around you. Delfeayo's playing on 'bone here is strong, confident, athletic, like you'd expect from someone who grew up with Branford and Wynton as his older brothers. His songwriting is also first-rate, with "Brer Rabbit" especially good. Taken from the theme for TV's "Moon Over Miami," which he wrote, "Brer Rabbit" has a bright, unforgettable little ditty as its main melodic theme, which gets stuck in your head even when the soloists are riffing over it, within it and way beyond it before returning to it for the close. It's an instant classic. Covers of Ellington's "Just Squeeze Me" and Victor Young's "Weaver of Dreams" are straight-ahead solid, as are the band's take on Marsalis' other four originals. It's such a strong recording that you, the listener, are left to hope Delfeayo doesn't wait another 10 years to record again. The opening track, "Jack Baker," is thick, heavy, primal. Pianist Joey Calderazzo comps sedatedly behind the opening measures to set a structured tone for the piece, then drops out to the first solo. The second song, though, "Hope" (written by Calderazzo) is as quietly introspective as "Jack Baker" was unrelentless (with some lovely soprano sax work from Branford). 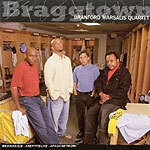 And yet, they're really not all that opposite  simply different sides of Branford's literate post-bop mainstream jazz he learned from his dad and honed in his youth touring with the legendary Art Blakey. Each of the songs here  all written by members of Marsalis' current quartet (rounded out by bassist Eric Revis and drummer Jeff "Tain" Watts)  is taken as an opportunity for extended soloing by each of the musicians. It's in these improvised passages that the real magic happens, a musical conversation among four of the most talented players in jazz today. None of the songs have particularly memorable refrains or themes; there's no "Brer Rabbit" here to get stuck in your head or join the jazz canon. Just some of the best out and out playing you'll hear this year.